I am on a pumpkin trend. Last week I shared these Flourless Pumpkin Muffins with Chocolate Chips. 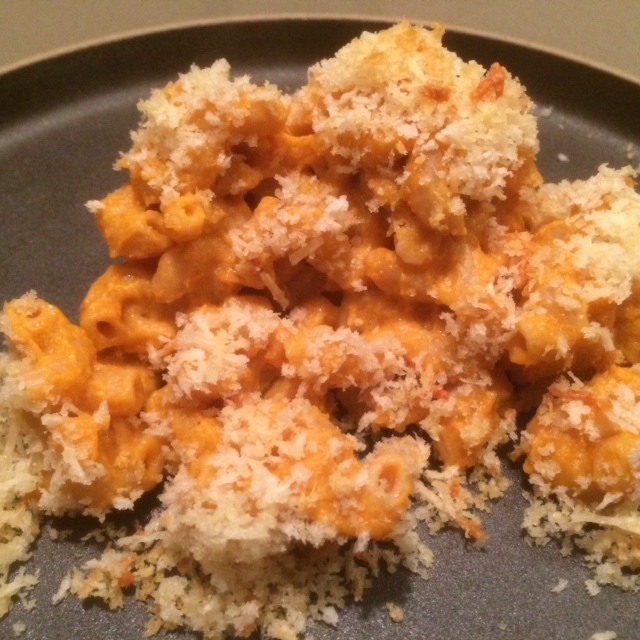 This week we tried a savory dish for dinner: Pumpkin Mac ‘n’ Cheese. It was good — depending on how much you like pumpkin. I like pumpkin but if we made this recipe again we would tweak it. We would put in less pumpkin and more cheese. The sauce could have been a bit creamier, so I think we would have played with the sauce a bit more. The breadcrumbs on top softened the heavier pumpkin flavor — the breadcrumbs are a must! Preheat oven to 375 degrees. Grease a 2 quart baking dish with 1 Tablespoon of the butter. Cook macaroni according to package directions; drain well and return to the pot. While macaroni cooks, melt remaining 2 Tablespoons of butter in a large saucepan over medium heat. Add flour and whisk until combined. Whisk in milk, salt, and black pepper. Cook and stir until thickened and bubbly. Add pumpkin and cheddar cheese. Cook and stir until creamy, about 1 minute. Remove from heat. Pour sauce over macaroni and stir to coat. Transfer macaroni to the prepared baking dish. In a small bowl, stir together breadcrumbs, Parmesan, and oil. Spread evenly over pasta. Bake for 15 to 20 minutes or until the topping is golden brown and macaroni is heated through. Serve and enjoy this pumpkin goodness.